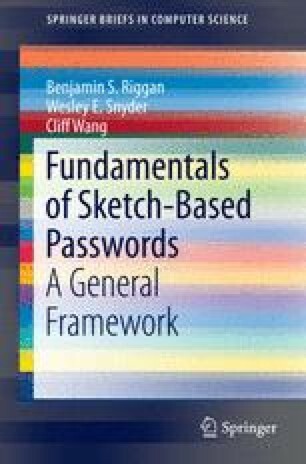 There are (at least) three primary considerations when designing a sketch-based authentication system: computational complexity, security, and tolerance. In this chapter, using the generalized Simple K-Space (SKS) approach, the efficiency of model construction is studied. There are two algorithmic implementations to construct this model: the direct/forward approach (or primal algorithm) or the indirect/backward (or dual algorithm). The efficiency of constructing the SKS model is important because the model is most definitely the computational bottleneck of this method. Here, the dual algorithm is shown to enable the use of a model approximation that significantly improves the efficiency for computing the high dimensional model representation. Also, the tradeoff between security and usability is analyzed using SKS. In particular, it is demonstrated that as smoothing parameters of the SKS model asymptotically approach zero, the model is unique and provides “perfect security.” However, we also demonstrate the model is generally not unique, but more robust, when a sufficient amount of smoothing occurs over the model. Therefore, SKS is shown to explicitly provide fine-tuned controllability of the security/usability tradeoff.